The superior quality of this Organic Extra Virgin Olive Oil is achieved by combining the most ancient and natural farming techniques with the latest understanding of the entire organic process of production. The organic process aims to maintain and improve the natural fertility of the soil, its biodiversity, and the balance of the ecosystem, by minimizing the use of non-renewable resources. Pressed from hand-picked olives, this unfiltered extra virgin olive oil is medium fruity with an elegant, yet complex, aroma of ripe tomato, basil and hints of black pepper. Its flavor is fruity and harmonious with a sweet almond finish. 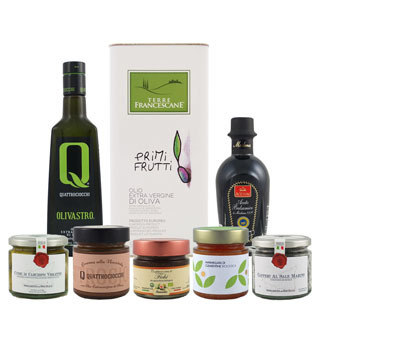 The Oleificio Basirico olive oil company lies on the beautiful sloping plains of Mount Erice in Sicily where they apply the latest technology for their oil press and grinding equipment. The oil is extracted using a continuous extraction cycle made entirely of stainless steel. During the course of the day, the olives are picked by hand and briefly stored in well-ventilated containers and then cold pressed the same day. The freshly-extracted oil is then stored in stainless steel containers where the natural settling process is allowed to occur before being bottled resulting in an outstanding quality product.